Carlisle Bay is a luxury resort looking out over white sand and turquoise water, with a backdrop of emerald green rain forest. 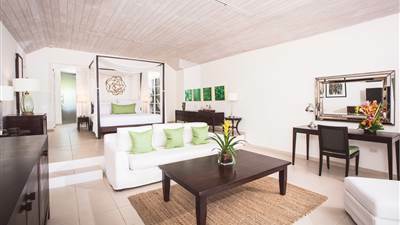 Click here for a gallery of all images at Carlisle Bay Antigua. Enjoy a range of activities at Carlisle Bay. Welcome to Carlisle Bay, a luxurious beach and spa resort located on the southern shore of the Caribbean island of Antigua. Situated overlooking white sand and tranquil turquoise waters, it is a small piece of paradise. Carlisle Bay is as perfectly suited to seclusion and relaxation as it is to activities and exploring. 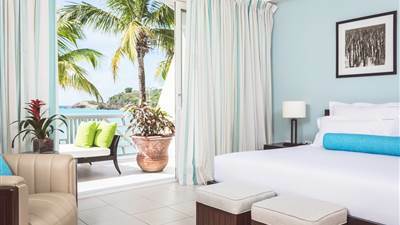 Our 5 Star Antigua Resort offers all-suite accommodation and separate family areas allowing each guest to enjoy the holiday that suits them best. Architecture is in keeping with the simple yet charming style of the Caribbean and the décor throughout is restful and elegant. A diverse range of restaurants and bars, many opening onto the beach, use the freshest of Caribbean ingredients to create their enticing menus. A visit to Blue Spa while visiting Carlisle Bay is a must for the ultimate holiday treat, while other facilities include tennis courts, water sports centre, library, yoga pavilion and movie screening room. 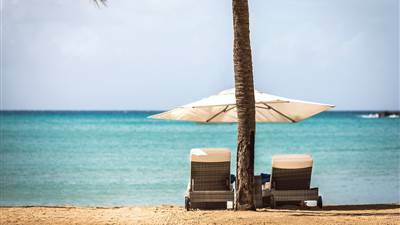 Staying at Carlisle Bay you will also be ideally situated to explore the fascinating Caribbean island of Antigua, both land and shore.